Find Your Heart and Live by It! Live your life with passion and with an open heart. Make living through your heart your priority, and benefit through uplifting and evolving your consciousness to free yourself from your ego mind. Realize your life purpose, and accelerate the evolution of your body, mind, and spirit. 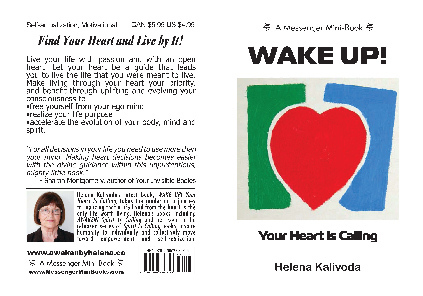 This book is unique – it is connected to a website that continues the message of this book through a FREE online environment. If you want a deeper, personalized experience of this book’s message, go to the link printed at the end of the book and input the book’s ID number (found also at the end of this book). You can then access the extended resources provided to you by the author for FREE. Enjoy your journey! Your heart, as a physical organ, has a counterpart in an etheric heart, which is in charge of the physical heart. This etheric heart connects to your planetary heart, and links all the way to Spirit and God. It pumps your blood. It makes you love. It acts as a connector between your physical and spiritual aspects. You come into this world with a fully open heart, but your heart may eventually succumb to being close when it is challenged repeatedly. Your heart, as a pump, will still be well equipped to support the biological life of your body, but the heart that is your divine connection will wait, poised and eager, for you to understand that without a warm, kind and loving heart, you will not be able to fully remember who you are. Your heart has its own intelligence. The heart’s intelligence is superior to that of your mind, and it is the heart’s intelligence that you should use. Through your heart’s logic the development of psyche, personality and ego occurs, which leads to the melding of all of them into one being that is led by your Spirit. When this happens you can accomplish from your heart all that you believe you can.